Pick a neighbourhood and explore its casual-gourmet dining options – the smaller eateries located either just round or at a corner, near a thoroughfare, down a lane, or in an enclave; staffed with (mostly) charming young men and women, the chef perhaps from Normandy, or Tuscany; pleasingly done up, with handwritten or chalkboard menus detailing sophisticated ingredients and avant-garde, region-specific or cosmopolitan fare. Take the short stretch of road along Bukit Timah, for example, the couple of kilometers between the Stevens Road flyover and Sixth Avenue. The food choices are overwhelming – two new restaurants at the Alocassia Service Apartments, (Italian, French), the Botanical Gardens with fine dining and garden dining, Cluny Court with Italian, haute-burger and gourmet take-aways; and on either side of Coronation Plaza – Japanese, French, German, local, Starbucks, a butcher, a retailer of German food, an Irish pub/bar, McDonalds … at the corner of Sixth Avenue and Bukit Timah Road, another explosion of eateries including a Brazilian churrascaria, Greek, artisanal bread, Italian gelatos. If you are not eating, but cooking, some of these restaurants retail hard-to-find ingredients; additionally, there are three Cold Storage supermarkets with their own range of organic, gourmet and specialty, there is a NTUC, there are outlets specializing in the healthy and the organic, boutique wines, even a little shop done up in black and white selling just chocolate cakes. 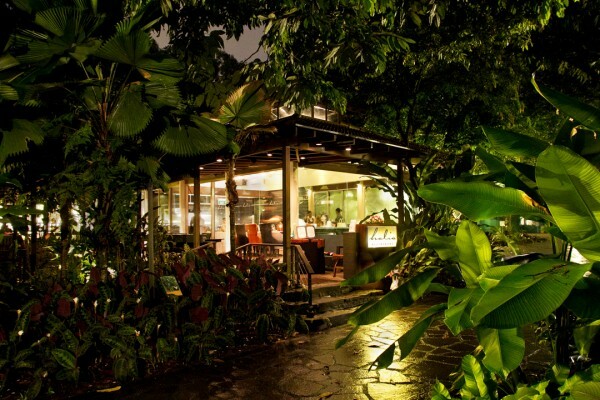 Driving down Bukit Timah Road, towards the Botanical Gardens, Al Borgo (Italian for to the village) comes up just before the Bukit Timah-Stevens Road intersection, with traditional Italian food, home fare from convivial Chef Mimmo (aka Domenico La Mura) who is from the south of Italy. One of the restaurant’s specialties : Chef Mimmo’s homemade sausages, served up in a variety of dishes. 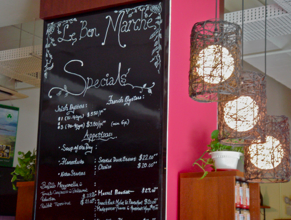 Next door is Le Bon Marché, which went through a number of incarnations – neighbourhood-gourmet to gourmet-retail to gourmet café – before it opened its current premises as a neighbourhood bistrot and gourmet shop. 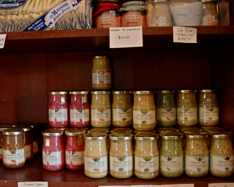 Eat and shop or shop and eat, because the ingredients used in their dishes are the ones displayed on their shelves. The menu reflects the seasonal changes in France, now white asparagus and Bouchot mussels, now quince and black muscat grape jam … in weeks or months it might be greengage plums or figs (perfect with Roquefort cheese); the jams and marmalades harvested, prepared and sold by disabled people from the south of France. Le Bon Marché supplies gourmet French and European ingredients to hotels and restaurants and are the sole distributors in Singapore for their products – artisanal cheeses from Masteur Affineur Bernard Antony, farmed non-pasteurized cheeses; a choice of fifteen to twenty varieties usually on display (customers can order from up to three hundred varieties and expect delivery in a week), jams and marmalades, oils from Italy and Spain (perfumed, blended, flavoured, infused, pure extracts, full pressed), foie gras, escargots, oysters from Ireland and France, butters, cold cuts, meats and fowl (duck, rabbit, guinea fowl, quail), hand ground mustards, (a best seller), vinegars (flavoured and otherwise, just Balsamic was available as a mousse – an emulsion smoother and sweeter than vinegar – a jelly, a vinegar, a sauce and a crème), wines, Bomba and Valencia rice (perfect for paellas), candied chestnuts, crème de salidou with sea salt, honey (lavender, white truffle, almond), freshly made cakes and pastries; even Buche Rose au Chocolat which, explains a patient and polite Sebastian, is natural, edible colouring which has been around and in use for three, perhaps four hundred years. Their menu depends on the season and the produce available – soups, sandwiches, salads, foie gras, oysters, escargots, platters, tapas, flamenkuche, meat, game and seafood dishes, desserts, coffees, hot chocolates, teas (black, green, herbal) and on weekends, breakfasts, a choice of a la carte or set menus – Seaside, Parisian or Farmer. 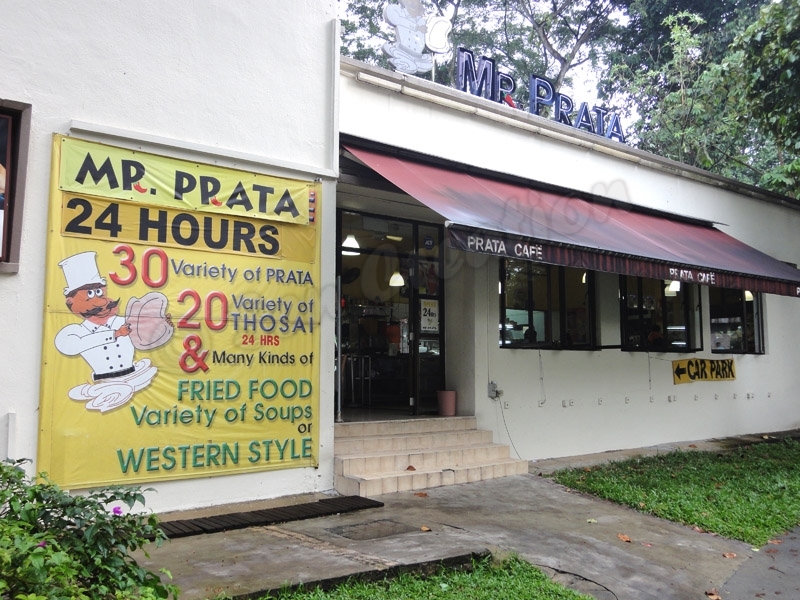 En route to the Botanic Gardens, turn left on to Evans Road for the small but extremely busy Mr. Parata, open 24/7, serving hot parathas and more; the dum biryani (mutton or chicken) which is available only on weekends is well worth the visit. Call Mr. Ali on 6235 6993 if you want to pre-order your take-aways. 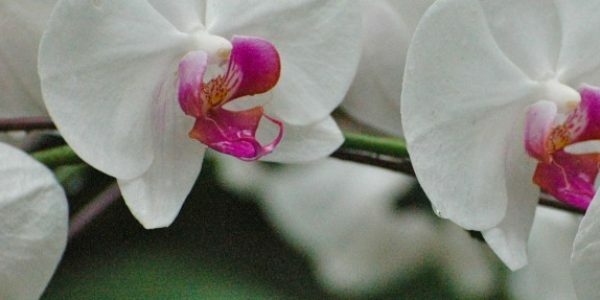 Halia at the Botanical Gardens is a favourite breakfast stop on weekends and tranquil dining at all times amidst the ferns and heliconias, the cascading waterfall just out of sight, the orchid garden to its left. 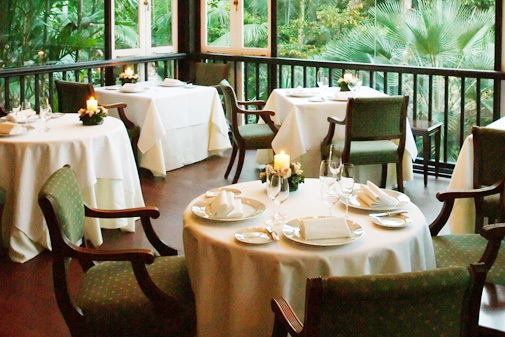 Au Jardin, (very ‘fine dining’ and certainly not ‘casual gourmet’) needs to be mentioned here because it is well known both for its contemporary gastronomic French cuisine and its location – a beautifully restored 1920’s colonial bungalow in the midst of the Botanical Gardens. 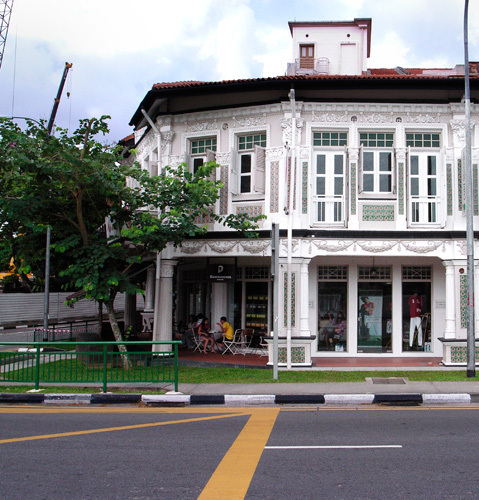 Then, the quaint, restored two-level 1928 shophouse/s that is Cluny Court, at the intersection of Farrer and Bukit Timah Roads, the Botanical Gardens to its right, the French Embassy behind. The two gourmet Da Paolo’s – the Il Giardino and the Gastronomia – between them, offer a great selection of food for dining in and taking away, gourmet coffees, olive oils, pastas and wines as well as single-serving portions of food, ready to be warmed and enjoyed, just perfect for lazy Sundays. Simply Bread is another winner, offering sandwiches, salads and plates … breakfasts, lunches and dinners … as well as varieties of freshly baked breads (different kinds on different days), rolls, croissants and delicious coffee. Relish has a great menu – a startling choice of burgers served with salads and fries, paired with a variety of beers (and fruit-based milkshakes for the non-beer drinkers) and some deserts. All-day brunches on Saturdays and Sundays are very popular with the neighbourhood residents, and ‘Chef Willin has created a wide range of burgers which are both good & fun to eat – there are burgers which won’t mess with what everyone expects of a good burger (think greasy smoky bacon, melted emmental cheese, medium-rare juicy beef pattie, guacamole all forced between lightly toasted sesame buns) to burgers that are – well not so traditional (for example – the Blue Cheese Beef Burger with Rucola, Poached Pear & Walnut Butter, the paper-thin omelet-wrapped Ram-Lee Burger, the Soft-Boned Char-Siew Pork Open Foccacia Burger & the Curry Chicken Burger)’. Denise Wine Shop offers quality, range and value in its wines from Australia, France, New Zealand, Spain, Italy, South Africa, Germany, Chile, Argentina, Switzerland, USA, Hungary, and Portugal. And then, there is Awfully Chocolate who say it best themselves : We resolved to put the cake back into cake and we would make it chocolate. So we started a cake shop selling only one cake – a simple dark chocolate cake between layers of dark chocolate fudge. Real cake one could bite into, rich in taste yet moist and light. Not just mouthfuls of mousse or cream. Not overly sweet but something you could eat and not feel disgusted with yourself right after. Something you would find yourself craving for regularly and never tire of. All these, within a kilometer: walking distance from sprawling gardens, homes, apartments, a university, a lodge and a sports stadium. The second kilometer, from Coronation to Sixth Avenue, continues the smorgasbord of offerings, and coupled with the new MRT stations – Botanic Gardens (Circle Line) and Stevens and Sixth Avenue (Downtown Line) scheduled to be completed by 2012, the neighbourhood-convenience factor escalates exponentially, not just between locations on this short stretch of road, but with other parts of Singapore. 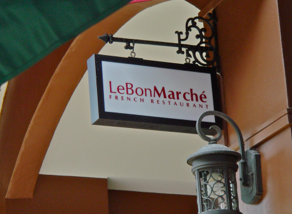 Photographs of Le Bon Marche by Anita Thomas, the others are from simplybread.com.sg, yoursingapore.com, feveravenue.com and forums.hardwarezone.com.sg.